Cece and I made these today after I picked her up from daycare. They were celebrating a birthday at daycare with chocolate cupcakes, and since Cece couldn’t have one (we are trying to be strictly gluten-free with her lately), I told her we’d make some at home. I was a bit limited in what I had- no carob or cocoa powder so chocolate was out. She LOVES dried cranberries so here is what we came up with. They are gluten-free and refined sugar-free. I used teff f lour in this recipe, which is my new favorite gluten-free, whole grain baking flour. 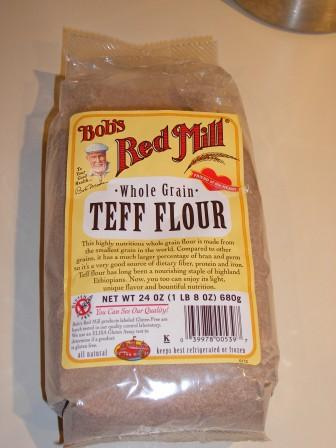 Teff is an ancient Ethiopian grain, tiny in size but packed with nutrients. It’s higher in protein than wheat and has a high amount of calcium, and thiamin (a b vitamin). AND it has 2X the amount of iron and wheat and barley. Its also a great source of fiber and will not spike your blood sugar like so many other refined grains do. You can easily substitute it in any recipe that calls for wheat flour. I always do 1/2 almond flour, 1/2 teff flour. The almond flour makes whatever you are baking nice and moist. 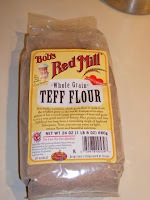 Teff is a must-have in the cupboard! 1. Preheat oven to 350 F. Grease a muffin pan. 2. Combine teff flour and baking powder together and mix. 3. In another bowl, combine apple sauce, maple syrup, egg, and melted butter. Mix well. 4. Add cranberries to the bowl with the flour mixture. Toss to coat them. 5. Add wet ingredients to dry ingredients and stir until combined. 6. Fill muffin pan and bake for 25 mins. For another delicious teff treat, see the cocoa brownie recipe.